Photograph courtesy Roger Geach. 25235 & 25060 at Wolverhampton on September 29th 1984, about to take over the 'Worth Valley Wanderer' railtour. The twenty one year one month career of D7585/25235 was split between allocations to London Midland & Scotish Region depots, with a definate dominance of the former. Dual brake equipped (March 1978). Center lampbracket & other fittings removed (March 1978). Time between last Classified repair and withdrawal: 83 months. November 1968 to Manchester Division (D09). May 1982 to Springs Branch. Renumbered to November 12th 1973. 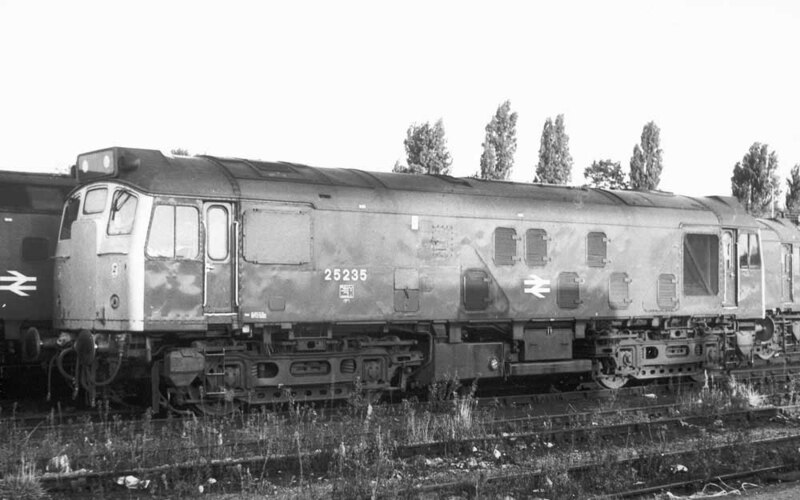 25235 was the 236th Class 25 withdrawn, one of three retired during March 1985. After withdrawal 25235 was stored at Bescot Yard from March 1985 until moved by rail to Basford Hall Yard on July 11th 1990, Carnforth (13th), Workington (14th), Carlisle (17th), Mossend (Aug 1st) and Glasgow Works (Aug 4th) for asbestos removal by MC Metal Processing. The locomotive then moved by road to Bo'ness during the middle of October 1990. Noted Crewe Works September 1968. Noted Derby Works September 1971. Noted Glasgow Works March 1978 (dual brake fitted). Noted Derby Works December 1983 & January 1984 (N4 repairs). Although D7585 was never allocated to any Eastern Region depots D7585 was noted on March 10th working the 08.30 Bradford Forster Square - Morecambe and the return 12.30pm Morecambe - Leeds. Two months later on May 15th D7585 & D7580 worked a Manchester Central - St. Pancras forward from ?? to St. Pancras after Class 45 No D115 failed. It was railtour duty on April 11th when the 'Midlands Enterprise' railtour from Waterloo was worked roundtrip Stockport - Dinting by 7585 & 7597. Both locomotives retained green livery with frame level white stripe and full yellow ends. 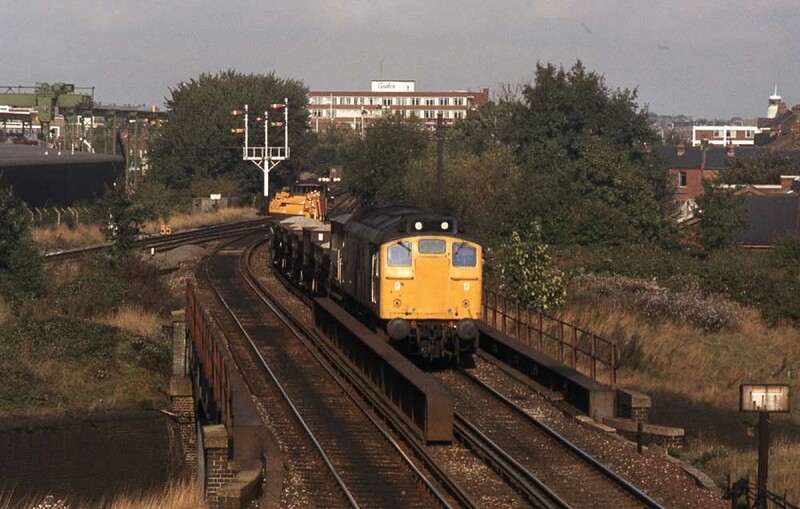 On September 4th the Derby - Yarmouth was worked to Norwich by 7585 & 7533. 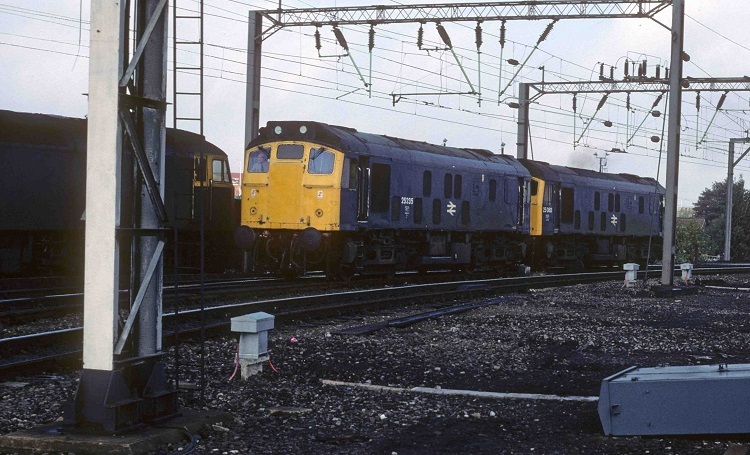 The 14.20 Euston - Carlisle on April 30th was worked forward from Preston by 7585. On July 8th 7585 & 5208 worked the 09.20 Manchester Piccadilly - Yarmouth to Lincoln Central, returning with the 09.28 ex-Yarmouth. A Leicester - Norwich football special on November 3rd 1973 was worked roundtrip (?) by 7585 & 5185. On May 24th the 09.11 Newcastle - Paignton was noted at Sheffield & Exeter behind 25235 & 25298, did they start out from Newcastle? A month later on June 28th 25235 worked the 09.00 Llandudno Town - York throughout. During July 1975 25235 was transferred to the Scottish Region, spending five and a half years allocated to either Eastfield or Haymarket. Photograph courtesy Tom Sutch. 25235 and its overhead line inspection train pass Morecambe South Junction on February 9th 1975. 25235 was noted on October 9th with the Fort William - Mallaig portion of the ex-06.00 Glasgow Queen Street. On December 6th Type 2s were in charge of a number of football & rugby specials in the Edinburgh area including 25087 & 25235. On May 9th 1977 25235 worked the 12.25 Dundee - Arbroath and 13.17 return. On May 9th 26029 & 25235 were noted working a Kyle - Inverness service. On July 28th 1978 25235 banked an afternoon service out of Glasgow Queen Street. About a week later on August 7th 25235 worked the 12.50 Edinburgh - Perth whilst on August 19th 25235 handled the 20.45 Carlisle - Perth forward from Mossend Yard. 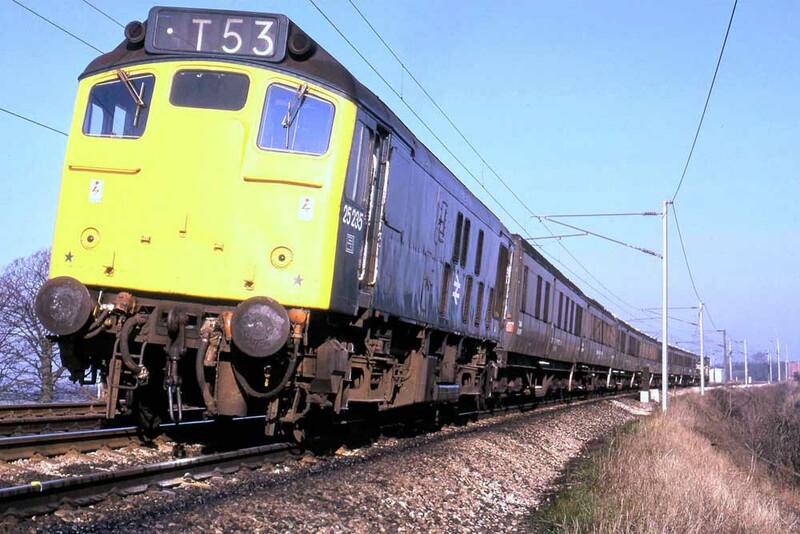 The ongoing shortage of Type 2 power in the London area found locomotives borrowed from distant depots with Eastfield’s 25235 & 25247 noted on local workings towards the end of August/beginning of September. The 10.40 Manchester Victoria - Llandudno Town on September 8th 1979 was worked by 25235. On January 11th Trafford Park freightliner depot was blocked following the derailment of 25235 whilst picking up the 22.37 Trafford Park – Holyhead freightliner. The departure of this working finally took place at 6.00am the following morning with 47098 in charge. However all was not well with this machine for it failed at Phillips Park, requiring the assistance of the Manchester Victoria pilot, 25196. On June 14th 1980 the 08.10 Glasgow Queen Street - Scarborough was worked to Edinburgh by 25235. The last week of July 1980 was hectic for 25235, starting off on July 25th with the 17.25 Glasgow Central - Stranraer Harbour with 25079, the same pair returning the next day (26th) with the 01.20 Stranraer Harbour - Blackpool North to Carlisle and the return 09.43 Blackpool North - Stranraer Harbour from Carlisle (or possibly Ayr?). On July 27th 25235 & 25079 worked a roundtrip between Mossend Yard & Stirling on the overnight motorail services. During February 1981 25235 was reallocated to Toton. On May 23rd 25235 worked the roundtrip Nottingham - Llandudno Town. The failure of 47547 at Derby on May 30th saw 25235 take the 09.58 Bradford - Paignton forward to Birmingham New Street. Four days later (June 3rd) the 10.33 Leeds - Paignton failed at Derby behind 47452, 25235 worked the train to Birmingham New Street. Two Gloucester - Birmingham portions of NE/SW expresses were handled by 25235, on June 13th with the 16.18 ex-Plymouth and on July 10th with an afternoon relief ex-Plymouth. The weekend of July 18th/19th saw 25235 & 25251 working two roundtrips over the Cambrian line. A rescue job on September 5th saw 25235 assist the 13.19 Skegness - Manchester Piccadilly from Chinley after 40188 failed. An 'E' exam was carried out at Toton during November. Photograph collection of webmaster. 25235, somewhere (maybe Warrington? ), some day. 25235 would fortunately reach preservation, hooray! 1982 produced a mixed variety of passenger workings for 25235 starting with the 07.42 Manchester Victoria - Bangor on March 6th. Just over a month later on April 13th 25235 worked a Crewe - Cardiff service. Three days later (16th) 25235 worked a roundtrip late afternoon/evening Manchester Victoria - Bangor - Manchester Victoria turn after 25067 failed prior to departure. On May 1st (and/or 3rd) 25235 worked the 18.15 Birmingham New Street - Norwich from Leicester to Norwich. A Barrow - Wembley Central football special on June 5th failed at Castlethorpe behind 40003, 25235 & 25060 worked the train forward to Euston. On June 26th/27th a weekend was spent on the Cambrian line with 25194; on 26th the 10.10 Euston - Aberystwyth from Birmingham New Street was followed by the 16.05 Aberystwyth - Shrewsbury. The next day (27th) it was the turn of the 08.45 Birmingham New Street- Aberystwyth, the 16.40 Aberystwyth - Machynlleth and 17.25 return and finally the 18.15 Aberystwyth - Euston to Wolverhampton. On July 21st 25235 was noted at Bristol Bath Road. On July 24th 25235 & 25184 worked the Derby - Norwich - Yarmouth - Norwich - Derby diagram, between Norwich and Yarmouth they worked the 08.10 Leeds - Yarmouth and the 14.31 Yarmouth - Sheffield. It was back to the Cambrian line on September 18th with 25182 to work the 10.10 Euston - Aberystwyth from Birmingham New Street and the 16.05 Aberystwyth - Shrewsbury, but 25235 failed and was removed at Machynlleth. An accident at Linslade Tunnel on December 9th created serious problems on the WCML, a series of extra services operated between Manchester & Sheffield, including 25235 working the 11.45 Manchester Piccadilly - Sheffield, the 13.15 return and the 17.15 Sheffield - Manchester Piccadilly (not sure how 25235 got back to Sheffield to work this). During the latter half of March 1983 25235 was quite active out of Carlisle. On March 12th it worked the 10.00 Carlisle - Leeds and the return 16.02 Leeds - Carlisle, on 14th the 16.02 Leeds - Carlisle was worked whilst on the 19th it was the turn of the 13.45 Glasgow Central - Carlisle doubleheaded with a Class 27. On March 24th 25235 worked the 12.50 Carlisle - Glasgow Central. The 09.45 Manchester Victoria - Bangor and 13.49 return was worked on April 5th 1983. 25235 & 25236 were together on May 7th 1983 working the 'Evening Star' railtour between Dorridge & Bewdley (ex-Paddington), 25236 failed at Kidderminster. On August 6th 1983 25235 & 25196 worked the 07.35 Euston - Aberystwyth from Wolverhampton, returning with the 14.00 Aberystwyth - Shrewsbury, however 25235 failed and was removed at Machynlleth (similar to the events of September 18th 1982). Blackpool was the resort of choice on August 12th/13th with 25235 working the 12th's 17.03 Euston - Blackpool North from Preston and the 13th's Birmingham New Street - Blackpool North day excursion from/to (?) Preston. 1984 was the last year of recorded passenger workings for 25235. On January 13th 1984 the 23.35 Euston - Glasgow Central was hauled by 25235 to Bletchley because of the power being off. Then followed five workings north of the border starting on February 14th 1984 with the 08.40 Carlisle - Glasgow Central and 15.50 return, February 15th's 12.40 Carlisle - Glasgow Central, March 6th's 07.30 Glasgow Central - Carlisle and 12.40 return. A lineside fire north of Golbourne Junction on August 23rd 1984 saw 25235 assist the 09.30 Euston - Inverness between Golborne Junction & Preston. The 'Worth Valley Wanderer' railtour on September 29th 1984 from Plymouth to Keighley was worked by 25235 & 25060 between Wolverhampton & Derby, travelling via Stafford - Crewe - Warrington Bank Quay - Manchester Victoria - Castleton - Hebden Bridge - Sowerby Bridge - Halifax - Blackburn - Preston - Carnforth - Skipton - Keighley - Normanton - Cudworth - Rotherham - Chesterfield & Derby for a total of 330 miles! Photograph courtesy Peter Lovell. On October 11th 1984 25235 crosses the Western Region mainline and heads for the Southern Region with an engineers train. An accident at Wembley on October 12th 1984 produced 25235's last recorded passenger working, assisting the 00.30 Manchester Piccadilly - Euston the distance of one mile from Acton Canal Wharf Junction to Willesden. 25235 was withdrawn on March 13th 1985. Page added July 6th 2013.